Here's a sweet no-bake dessert for these hot summer days! ﻿It's perfect for those days when you don't want to turn on the oven and still have a great tasting and looking dessert. It was my daughter Tati's 15th birthday, we had this for dessert instead of our traditional Ice Cream Cake. It is sweet and tart and oh so delicious. Just layer the ingredients in a glass and your are done. I was inspired by a recipe (thus, a Recipe from the Hood) posted by Mary at Home is Where the Boat Is for this dessert. 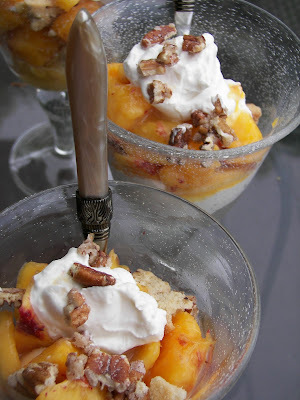 Mary posts excellent book review and tablescapes and makes tempting desserts. First of all, I want to say that this is one of "those desserts," that doesn't have an exacting recipe -- so just go with the flow. 1 package Sandie's Pecan Shortbread or any shortbready cookies, broken into small pieces -- each glass will take about 4 cookies -- 2 in each layer. 1 cup pecans, broken up in small pieces and sugared. See directions below. Place crushed cookies into glass and cover with nectarines (about 1/2 of a medium nectarine). Add 1-2 teaspoons lemon curd and 2 tablespoons of whipping cream. Repeat. Top with sugared pecans. Red Couch Recipes Note: Yield: This recipe made 6 desserts. To sugar pecans, place 1 cup pecans in small sauce pan, add about 4 tablespoons of sugar and cook on medium heat until sugar melts, making sure your stir constantly. Quickly take off heat and turn pecans out on foil and allow to cool before using. 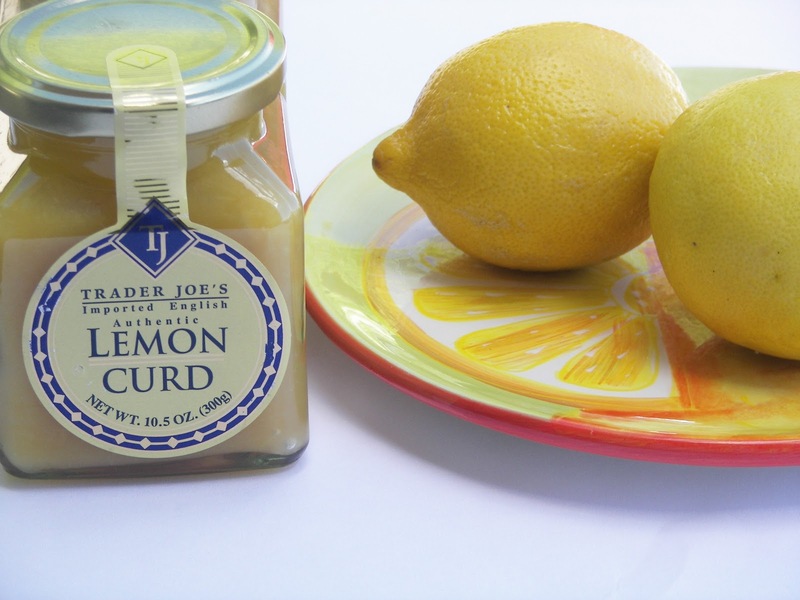 Thanks to my sister Jean who lives in San Antonio for the wonderful Trader Joes's Lemon Curd used in this recipe. She recently made a trip to California and picked me up four bottles. There are no Trader Joe's in Utah where I live or Texas where she lives. Trader Joe's Lemon Curd is a weakness. Mmmm.... this sounds really good! Love anything with lemon curd in it! Plus, no oven?! Count me in! Come and get in on my giveaway! We have a Trader Joes but it's far across town so I rarely shop there :( For this recipe I'd make the trek! Visiting from Kim's party. I need to go to Trader Joes. I have heard so much about Lemon curd from there. Looks like you have some yummy recipes. Will be back to check them out. Mega yum! 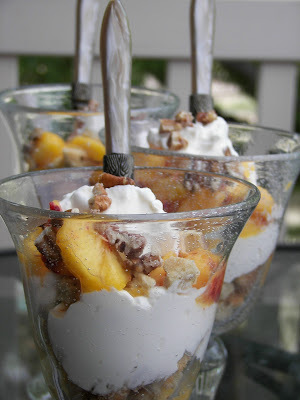 Lemon curd and nectarines and cookies and cream - what could be easier. Your presentation is so pretty too. Mary has just the best ideas and photos doesn't she? I see you are on Pinterest! How fun. I love it. Now I have a ton of things I want to make!